The effect of distributed coseismic slip on progressive, near-field edge waves is examined for continental shelf tsunamis. Detailed observations of edge waves are difficult to separate from the other tsunami phases that are observed on tide gauge records. 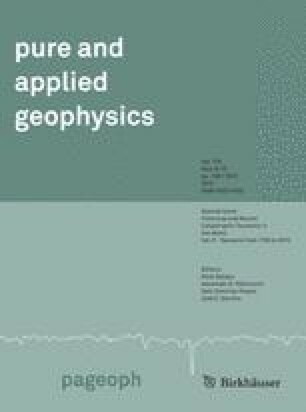 In this study, analytic methods are used to compute tsunami edge waves distributed over a finite number of modes and for uniformly sloping bathymetry. Coseismic displacements from static elastic theory are introduced as initial conditions in calculating the evolution of progressive edge-waves. Both simple crack representations (constant stress drop) and stochastic slip models (heterogeneous stress drop) are tested on a fault with geometry similar to that of the M w = 8.8 2010 Chile earthquake. Crack-like ruptures that are beneath or that span the shoreline result in similar longshore patterns of maximum edge-wave amplitude. Ruptures located farther offshore result in reduced edge-wave excitation, consistent with previous studies. Introduction of stress-drop heterogeneity by way of stochastic slip models results in significantly more variability in longshore edge-wave patterns compared to crack-like ruptures for the same offshore source position. In some cases, regions of high slip that are spatially distinct will yield sub-events, in terms of tsunami generation. Constructive interference of both non-trapped and trapped waves can yield significantly larger tsunamis than those that produced by simple earthquake characterizations. The author gratefully acknowledges the constructive comments of Tom Parsons and two anonymous reviewers, as well as discussions with Bob Morton and Guy Gelfenbaum regarding field observations of the 2010 Chile tsunami. Bürgmann, R., M. G. Kogan, G. M. Steblov, G. Hilley, V. E. Levin, and E. Apel (2005), Interseismic coupling and asperity distribution along the Kamchatka subduction zone, J. Geophys. Res., 110, doi: 10.1029/2005JB003648. Geist, E. L. (2002), Complex earthquake rupture and local tsunamis, J. Geophys. Res., 107, doi: 10.1029/2000JB000139. Kiser, E., and M. Ishii (2011), The 2010 Mw 8.8 Chile earthquake: Triggering on multiple segments and frequency-dependent rupture behavior, Geophys. Res. Lett., 38, doi: 10.1029/2011GL047140. Lavallée, D., and R. J. Archuleta (2003), Stochastic modeling of slip spatial complexities for the 1979 Imperial Valley, California, earthquake, Geophys. Res. Lett., 30, doi: 10.1029/2002GL015839. Lay, T., C. J. Ammon, H. Kanamori, K. D. Koper, O. Sufri, and A. R. Hutko (2010), Teleseismic inversion for rupture process of the 27 February 2010 Chile (Mw 8.8) earthquake, Geophys. Res. Lett., 37, doi: 10.1029/2010GL043379. Luttrell, K. M., X. Tong, D. T. Sandwell, B. A. Brooks, and M. G. Bevis (2011), Estimates of stress drop and crustal tectonic stress from the 27 February 2010 Maule, Chile, earthquake: Implications for fault strength, J. Geophys. Res., 116, doi: 10.1029/2011JB008509. Lynett, P. J., and P. L.-F. Liu (2005), A numerical study of run-up generated by three-dimensional landslides, J. Geophys. Res., 10, doi: 10.1029/2004JC002443. Mai, P. M., and G. C. Beroza (2002), A spatial random field model to characterize complexity in earthquake slip, J. Geophys. Res., 107, doi: 10.1029/2001JB000588. McCloskey, J., A. Antonioli, A. Piatanesi, K. Sieh, S. Steacy, S. S. Nalbant, M. Cocco, C. Giunchi, J. D. Huang, and P. Dunlop (2007), Near-field propagation of tsunamis from megathrust earthquakes, Geophys. Res. Lett., 34, doi: 10.1029/2007GL030494. Pollitz, F. F., et al. (2011), Coseismic slip distribution of the February 27, 2010 Mw 8.8 Maule, Chile earthquake, Geophys. Res. Lett., 38, doi: 10.1029/2011GL047065. Yamazaki, Y., and K. F. Cheung (2011), Shelf resonance and impact of near-field tsunami generated by the 2010 Chile earthquake, Geophys. Res. Lett., 38, doi: 10.1029/2011GL047508.